Will Lisbeth arrive in time to save her daughter from the clutches of Rome? How can God possibly redeem such a slew of unwise decisions and deep regrets? I can’t believe it’s time to say goodbye to these special characters that I’ve come to know and love! The only consolation I have is that this fantastic series has a special place on my keeper shelf, and I can revisit third-century Carthage again and again. 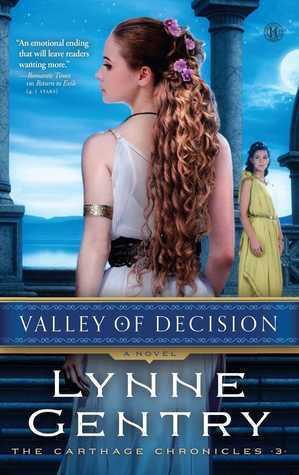 Valley of Decision is a sensational conclusion to the Carthage Chronicles! Once again, Lynne Gentry deftly weaves past and present together and brings to life the history, drama, and romance of this extraordinary story. Full of heart-wrenching emotion and poignant truths, this story of faith and family will leave you breathless! I absolutely loved the Carthage Chronicles and can’t wait to experience this incredible author’s next adventure! 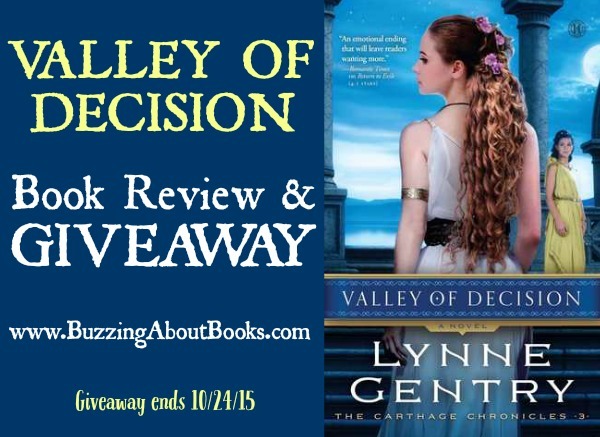 I am giving away a print copy of Valley of Decision to one lucky reader! To enter, please answer the following question in the comments section, and be sure to include your email address! This giveaway is open to U.S. residents only and ends Saturday, October 24 at 11:59 p.m. CDT. The winner will be drawn and announced on Sunday, October 25. Good luck!! If you could travel back in time, what time period would you visit? If I could travel back in time, there are so many different times that would be fun to visit–but not live there permanently, because I love my modern conveniences. One particular time that I would love to visit is the early 1900’s. This is the time when my grandmother was born and I would really love to become acquainted with those times and places where she grew up. Thank you for offering a copy of Valley of Decision. I posted this giveaway on my Pinterest Book Giveaway board. I follow by newsletter and on my readers. I love my modern conveniences, too! Thank you for following my blog and sharing the giveaway, Kay! Good luck! I would love to read ‘Valley of Decision’ – thanks for the giveaway opportunity and the review!! If I could time travel – it would definitely be to those years when Christ was living on earth. An unbelievable experience!! I am a follower, & have shared this post on FB!! That would be an incredible time to experience, Bonnie! Thank you so much for being a blog follower and sharing the giveaway! Good luck! If I could travel back in time, I’d probably want to be alive when Jesus was roaming the earth. I’ve never heard of this author, so I really look to bloggers and reviews like yours in making decisions when deciding my next book. Thank you for s beautiful review. This book sounds like a page turner and one that has great character depth. I hope to meet these great characters soon! Thank you for posting! I’ll be sure to check more about the author. I highly recommend Lynne’s books, Sarah! She is a master storyteller! Best of luck in the giveaway! Thanks for the tremendous shout out, Britney. The Depression was such a devastating time; it would certainly be an eye-opening, emotional visit! Thanks so much for being a blog follower and sharing the giveaway! Good luck! Sounds like a fellow Grapes of Wrath lover. I would love to read the exciting conclusion to the Carthage Chronicles series. I follow your blog and have shared the giveaway on Twitter and Facebook. I would love to travel back to the 1860’s and experience the Civil time period. Thank you for the great review today, Britney. I enjoyed reading it ! Such a pivotal time in American history! Thank you so much for following my blog and sharing the giveaway, Deanne! Good luck to you! I have always loved the Civil War era but I also would like to live during the early years of the twentieth century. There were so many inventions and discoveries! Thanks for this giveaway. I follow your blog and I have shared on Twitter. It would be fascinating to experience the innovations and advancements of the early 1900s! Thanks so much for following my blog and sharing the giveaway, Connie! Best of luck! I would love to go back to when my grandpa lived as a boy about 1900 and meet all of those people he always spoke of. What a special visit that would be, Amy! Thank you for being a blog follower and sharing the giveaway! Good luck! Britney, thanks for the fantastic review! I would want to visit the time period of the Book of Acts. Those were exciting times! I can’t wait to read VALLEY OF DECISION. I follow your blog and shared the giveaway on facebook. Exciting times, indeed! Thank you, Caryl, for following my blog and sharing the giveaway! Best of luck to you! I would like to time travel to either early 1800’s England or WW2 United States because those are two time-frames that I have been reading about recently. Thanks for the review and giveaway! I shared this giveaway on Twitter and Pinterest. I love reading about these time periods! Thank you for sharing the giveaway, Loraine! Good luck! I would love to go back to the regency time period. But only if I was well titled and wealthy. 🙂 I follow you and shared on twitter and pinterest. Oh, what elegance and fashion! Thanks so much for being a blog follower and sharing the giveaway! Good luck! I would go back to the the Old West – looks exciting!! Visiting the Old West would be quite an adventure! 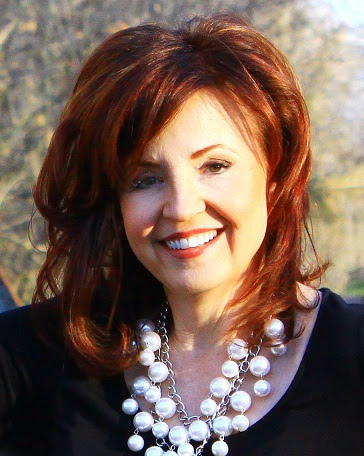 Thank you for following my blog, Beth! Best of luck to you! Not sure how far back I would want to go, but maybe the early 1900’s when there were so many changes going on, and new inventions and cenveniences coming about. The early 1900s would be a very interesting time to experience! Best of luck in the giveaway, Patty! If I could travel back in time… Hmm! That’s a hard question!! I’d like to visit Rome at the height of its power or when the early church was first getting started. It would be interesting to compare/contrast it to today’s society. I’d pretty much like to visit any time period actually 😅 mdp94 (at) bellsouth (dot) net I shared on Twitter, and I follow the blog (via email)! It is a hard question for me, too! 🙂 There are several time periods that intrigue me, which is why I love reading historical fiction! Thanks so much for being a blog follower and sharing the giveaway! Good luck! I would have gone back to the time of the Lewis and Clark expedition West. I would have loved to have gone on that trip to see the land, the people, the plants and animals, and the foodstuffs. Also the big rivers and untouched pristine landscape. It would have been so exciting. Yes, that would have been a very exciting time! Best of luck in the giveaway, Joy! I would travel back to the early 60’s when I was a little girl and all my loved ones were alive and well. What a wonderful visit that would be, Janet! Best of luck in the giveaway! I think during the Civil War or the Victorian period.